Iain Goodyear is a filmmaker, motion graphics animator and photographer based in the UK, and likes to work with experimental and abstract in nature. 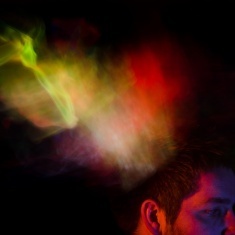 He also works as a media tutor, teaching music video and motion graphics production. 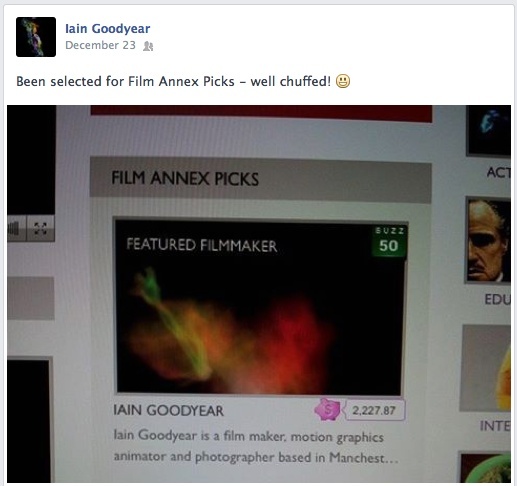 Iain is one of the most active filmmakers on Film Annex and also currently in the top 5 of Film Annex Picks. 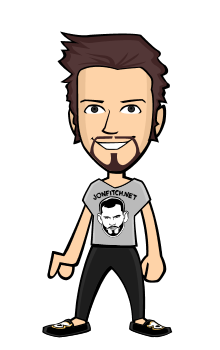 Since he has been using the platform, he has mastered the way it works and regularly updates his profiles with films and blogs, as well as actively shares his work on social media. Film Annex has also allowed him to discover other filmmakers and writers, and connect with them, as he says it himself on one of his latest blogs. In the interview below, Iain comments on his experience with Film Annex and connecting with other filmmakers. he also gives advice to new comers on the platform, shares his favorite feature, and explains how he has been using the revenues he generated on Film Annex. Iain Goodyear: First and foremost with nothing but praise for what is a superbly designed forum to showcase creativity and a love of filmmaking. I have been using Film Annex since August 2013, having become aware of it through a great friend and talented filmmaker Daniel Hopkins. I had been up until this time actively uploading and sharing my work through sites such as Behance, YouTube and Vimeo for a number of years, so I was no stranger to online distribution of my work. After a short time exploring Film Annex, I quickly realized that this was a platform very much concerned with sharing creativity and more importantly, building a community spirit amongst its user base. Immediately I realized this was a platform I wanted to immerse myself in. I made the conscious decision that I would use Film Annex as a platform to discuss my work in a depth that would help others understand what I was about, creatively speaking. This initial aspiration soon made me realize that I was approaching the uploading of my work to Film Annex in a much more introspective way compared to sites such as Vimeo, YouTube and Behance. What I found as I continued to upload and share my work on Film Annex was that I was becoming more conscientious and thoughtful in the way I discussed the concepts of my moving image and photography work. Alongside this I found an interaction with other Film Annex users who seemed to genuinely have an interest in the work I produced. I have experienced this on other platforms but not to the same degree. This connectivity to others on Film Annex has only been achievable through the easily accessible ability to share content via social media, something that I think this platform does so very well. Where I think Film Annex stands above other platforms is in the help and guidance it gives its users to share content through social media. 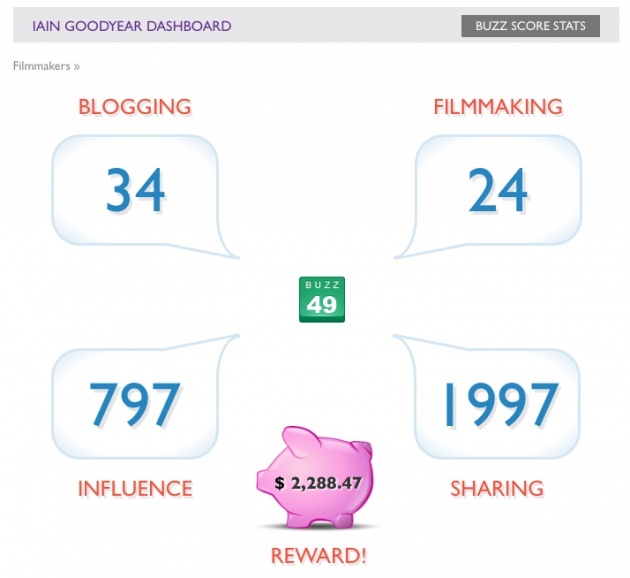 Their buzzscore system is a fantastically visual way of encouraging the use of social media as a versatile tool to share content with others. What truly makes Film Annex stand out and above other platforms is the way it rewards users financially. I have never before encountered an online platform that showcases creativity in so many forms, and rewards directly those who are driven to be creative and share with the world the fruits of their creative labors. FA: Is there any advice you would give to a newcomer on Film Annex who is looking to make money? IG: Be active in connecting with those whose content you enjoy or admire. Share their work through social media and try to make them aware of your appreciation directly (Twitter, Facebook ,etc). Through this you can help to build mutually beneficial online relationships that are based on respect and admiration of the work you and others do. IG: The sense of community and the rewards given to those who are active and actively engage with others. The curated nature and categorization of the content also helps in seeking out work you have an interest in. IG: The ease with which you can share content and connect with others who are inclined to do the same. Also, the way you can monitor your own reach through social network hits in relation to the content you share. IG: Film Annex has absolutely changed the way I promote my work. I am able to promote my work through the social networking outlets that are easily accessible once I have posted content. Put simply, Film Annex has allowed me to actually make money through proactive social networking, made possible through accessible means provided by this platform. IG: Right now I am using revenues made through Film Annex to fund the purchase of filmmaking equipment that will allow me to produce more content that I can showcase on Film Annex.